When looking for a outdoor light with motion detector for your highlighting needs, a Designers Fountain P218C-06 will be one you will want to look at. It is a line voltage light fixture with two light bulbs that can be independently pointed to cover a two different items to highlight. You will get a fixture in a white finish(also available in a bronze finsh), two light bulbs (Par-38 150 watt), Motion detector and hardware. Most fixtures from other vendors will not include the light bulbs at this price, please check the specifications before ordering. It will not come with the electrical box for installation as each case will have different wire run requirements. Can be used in all outdoor locations. Motion detector has a range of 180 degrees. Does not work as a dusk to dawn sensor. If you want to trade out for a dusk to dawn sensor for a different type of light coverage it will be an additional expense, but can be wired in the same place. Installation will take little time if you have your electric box already installed. You will have to attach the socket part to the backplate. At this time do not tighten so that it can be adjusted after connecting the backplate to the outlet box. Attach the motion sensor to the middle hole. Connecting the wires color to color with wire nuts is all of the wiring you will have to do. Follow the instructions and connect the head units to the motion sensor outlet wires. Connect the power side of the motion sensor wires to the wires from the outlet box. Just connect the backplate to the outlet box and make sure the wires are all inside. After installing the bulbs you will have to adjust each head unit until you get the desired results. 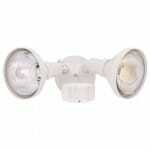 When looking for a outdoor light with motion detector, you will have several options. This Designers Fountain P218C-06 fixture will be a low cost solution. This fixture comes with the light bulbs. Any questions or comments on this post use the form below. If you need further information on this fixture follow the link here. Hello John, we have an outside light, but we shut it off because it was to often reacting on the tiniest spider, I wonder if there are motion detectors which do not react that prompt? Replace the motion detector with one that can be adjusted for distance and density of the object in motion. It does need to be wired in and if this is not something that you can do, I would get an electrician. You provide a good review for what looks like a good and cheap option. I am planning to have my rear garden landscaped in the spring time and a motion sensor light is on my list of things to include. Are there any higher end options that you would recommend. I don’t mind paying good money for a product of it is of good quality. Many other options will be available. Follow the link to vedor and you can navigate to the light of your choice. I will be looking into some more of these type of lighting options. These are great, even the cat can turn the lights on now. I love the energy these things save. That in and of itself is reason enough to buy one. You never have to fumble for the switch either. The good thing about these lights is that once installed, no other maintenance is needed. The bulb should last a long time and it will go on and off by itself. You can monitor a big area of your outdoor space and when you come home it can be lit up like daylight.